White Chocolate Bunny Ears: Roisin Murphy. Mansion. October 24, 2008. 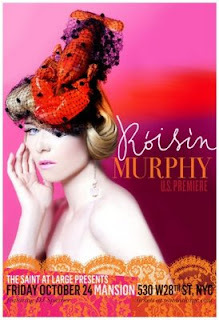 Roisin Murphy. Mansion. October 24, 2008. Murphy connected well with her adoring audience, projecting into the crowd and crouching down to grab hands. She commented that she's waited a long time to to play NY, "but I'm here now." There is word that she will return next spring during a full tour. Roisin has maintained that performing is very important to her. I was reminded of Peter Gabriel's early days with Genensis. Their music was compelling and entrancing to hear, and in performance took on the dramatic aspects of theater. Roisin changed costumes almost for every song: looking like a sleek biker chick, Little Red Riding Hood, or a plaid deer. My favorite outfit was probably the furry wings. My own snaps didn't turn out too well, but there are some superb photos and video posted on other blogs here, here, and here. Murphy's NY debut was actually part of the CMJ marathon - a five day showcase of over 1,000 bands from around the world. She certainly outclassed (and outdressed) the mostly unknown, low-profile indie bands playing all over the city, often for free. This was certainly the only time I will even get near the ultra swanky club, Mansion, formerly Crobar, in Chelsea. Looking almost decrepit from the outside, the interior is surely somebody's idea of - what? High style? Maybe a 21st century version of Morris Lapidus, full of the same self-important desire to dazzle, but without the surrealism. Mansion is huge, but it felt like we were packed into phone booth as I stood shoulder-to-shoulder with other fans on the main floor, maintaining my balance while being jostled by clubbers who tried to dance, or even just breath. But the venue was an excellent choice to showcase Roisin's flashy, glitzy electro-pop.